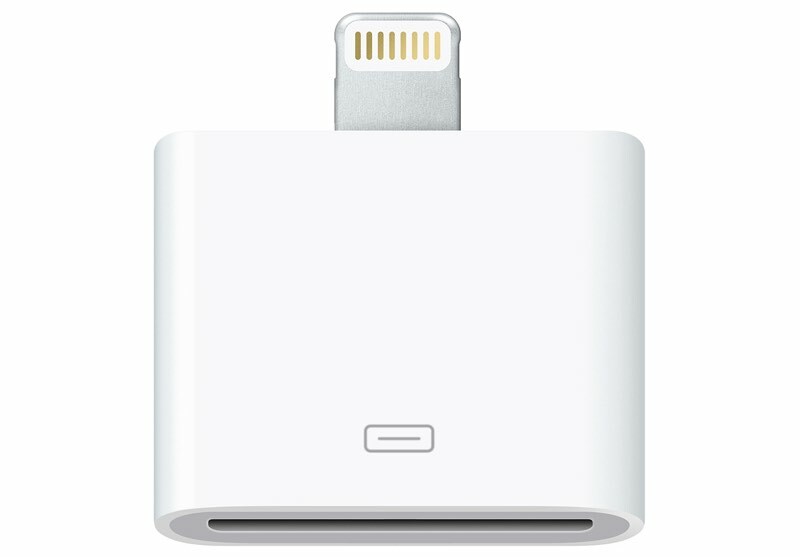 Apple has discontinued its $29 Lightning to 30-pin Adapter and has removed the accessory from its website as of this week. The Lightning to 30-pin Adapter was first introduced in 2012 after Apple debuted the Lightning connector to replace to 30-pin connector that had been used in iPhones and iPads up to that point. At the time of the transition, many people were using 30-pin cables for charging purposes for existing devices, prompting Apple to launch the adapter. The adapter was also useful for connecting existing 30-pin accessories to the new Lightning devices. Lightning connectors are significantly thinner and more compact than 30-pin and the switch over to the more svelte Lightning connector allowed Apple to save space for other components in iPhones and iPads. Apple's iPhone 5, fourth-generation iPad, and first-generation iPad mini were some of the first devices to use the new Lightning connector, which has been present in all mobile devices since 2012. It's now been six years since Lightning was introduced and there is no longer a need for the Lightning to 30-pin Adapter as a limited number of those cables are still in use in 2018. First they kill the headphone jack and now the lightning to 30 pin adaptor? What's next? The home button? And we march ever closer to apple removing the lighting port entirely in the quest for a “wireless future” that nobody even wants. EDIT: a lot of follow up comments from people who seem to disregard the physical limitations of wireless connections. I work in pro av and daily use gear to transmit wireless audio and video at very low ms round trips which is critical for use in live environment. The frequencies needed to transmit lots of data quickly are all being purchased up by telecoms to provide you with 4G and 5G devices, this means there won’t be much room left for your fantasies about wireless HDMI and the like. Plus, have you used wireless charging? I have and it’s a disaster and based on recent rumors, it’s one not even the great Apple can figure out how to fix. I love wired because it’s RELIABLE and it’s FAST. I’ll change my tune when wireless (charging, video, and audio) can do that, but unless there’s some imaginary spectrum that we haven’t discovered yet (or Pied Piper can decentralize the internet with their breakthrough compression algorithm ;)) it ain’t happening cause the spectrums are getting more saturated by the day. I want wireless stuff. In the current implementations, it's useful for making devices impervious to water and dust. In the future, I want to stop having to plug my devices in. I just want them to work all the time. Definitely like wireless communication. Nice not having ethernet cables everywhere. Next thing that should go wireless is HDMI. Maybe this will force lazy hotels to upgrade their alarm clocks that still have dock connectors on them. "Nobody"? Don't count me in that sweeping generalization. I hate wires. The sooner I can eliminate them from every facet of my life the better. Wouldn’t Apple need a hardwired port available for troubleshooting? There will always be a physical port of some kind, just not necessarily what we're used to. Something like the SmartConnector would be an effective solution which could in theory provide USB 2 speeds and connections for things like wired headphones, data transfer, diagnostics, and even charging. Truly an end of an era. Haven't seen anybody using a 30-pin cable these days except for myself. Always fun to ask if someone has a 30-pin cable and hear the countless responses of "what is that?!". Cue the handful of people outraged about this because they still have the 30 pin docking alarm clock they bought in 2010.